At the time, many researchers had not focused on 1.5°C pathways, thinking it was a near-impossible target. But since the Paris Agreement, a new wave of literature has emerged (including a special report by the Intergovernmental Panel on Climate Change, due for release October 2018). In this report, we review two of recent publications on possible pathways to a 1.5°C future which show how extremely ambitious, though not impossible, a 1.5°C goal is to achieve. Each signatory to the Paris Agreement agreed to nationally determined contributions (NDCs), or goals that each country agreed to in keeping with these ambitious targets. NDCs are all based on certain model assumptions, or rather, storylines. Climate models are based on emissions scenarios that seek to illustrate certain storylines and their impacts. 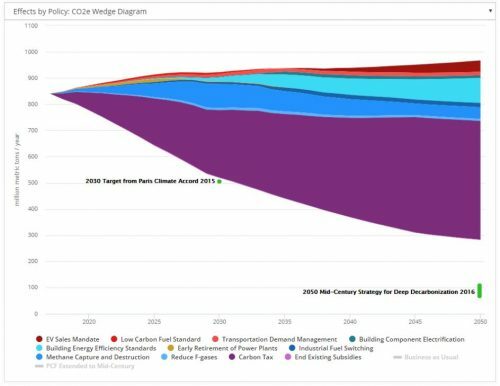 Virtually all of the storylines currently being modeled for a 2°C (or less) rise in average temperatures by 2100 operate on the assumption of overshooting our carbon budget in the first half of the 21st century, then heavily relying on carbon dioxide removal (negative emissions, particularly through Bioenergy Carbon Capture and Storage, or BECCS) to rein in our overshoot. A recent publication by Obersteiner et. al (2018) encourages us to reconsider this conventional 1.5-2°C storyline. Instead of risking an overshoot of emissions, and/or relying so very heavily on [yet-to-be-developed] technologies to remove that carbon (Figure 1a), the authors lay out three alternative scenarios. The first scenario, coined ‘Rapid Decarbonization’ (Figure 1b), is idealistic, assuming immediate and exponential ramping down of emissions. Instead of assuming that emissions will peak in 2020, and be halved every 25 years (as existing model storylines often do), this scenario assumes a half-time of only 10 years. While this scenario would require a complete transformation of existing infrastructure (and political will), the payoff by the end of the century is unquestionable. It eliminates the reliance on large scale BECCs or direct air capture (DAC), assuming negative emissions solely from land use change (LUC). It also stays safely below a cumulative 21st century carbon budget of 232 GtC. 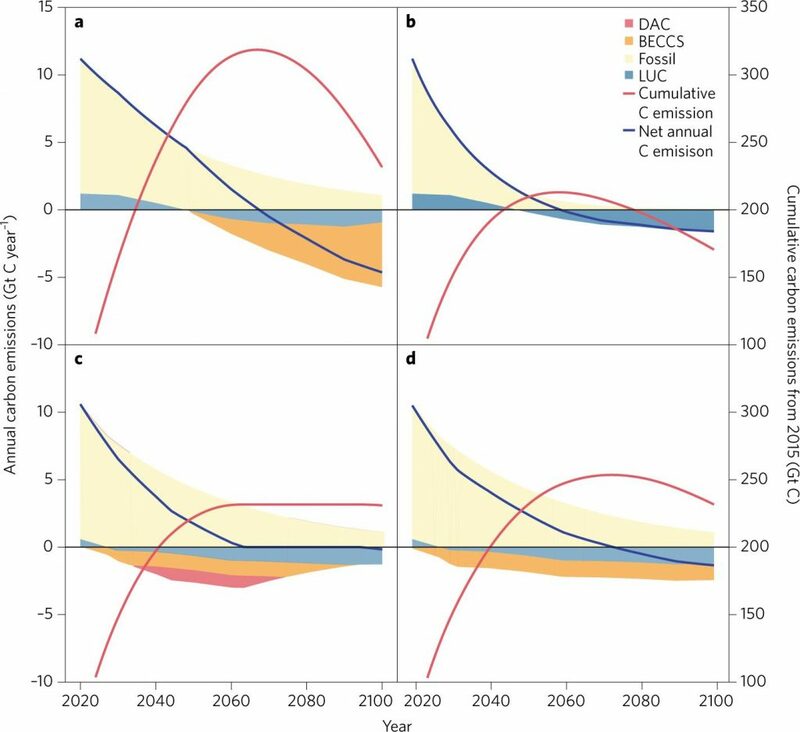 The second scenario is coined ‘No Overshoot’ (Figure 1c), and assumes a future with slower emissions reductions, but immediate and aggressive deployment of carbon dioxide removal technologies (BECCS, DAC, and Land Use Change). While this scenario’s emissions reductions are not as aggressive as the ‘Rapid Decarbonization’ storyline, it is similarly appealing because it avoids countless and significant unknowns that accompany overshooting the carbon budget (for instance, what if ice sheets melt at lower temperature rises than currently predicted?). Whereas our conventional model scenarios rely very heavily on massive deployment of carbon removal technologies toward the latter half of the century, this scenario avoids such a massive endeavor by rolling out those technologies sooner than later. The third (Figure 1d) scenario, termed, ‘Minimize Carbon Dioxide Removal,’ assumes an earlier scaling up and deployment of BECCS and no reliance on DAC. It does, however, run the risk of overshooting the carbon budget, though by no means as high an overshoot as that assumed in the conventional model scenario of RCP 2.6 (1a). The latter two scenarios both have the appeal of lessening late-century massive scaling up of carbon removal technologies. While they both rely heavily on these technologies still in their infancy, it does so sooner than later, before potentially overshooting the carbon budget. Therefore, less peak capacity of these technologies is required in the long run. In all the scenarios, including the late-century carbon dioxide removal scenario that current policies are based upon, the overarching assumption is that emissions will peak in 2020. Obersteiner’s group also ran analyses based on a 2025 peak emissions assumption, and the difference is striking and sobering. Just a five year delay in peaking global emissions results in significantly more natural land loss, a much higher overshoot, and a much greater reliance on negative emissions technologies. It should also be noted that all scenarios assume a carbon price. The impacts of van Vuuren et. al (2018)’s scenarios collectively on global emissions (2a), both without (2b) and with (2c) mitigation by way of a carbon tax. Van Vuuren et. 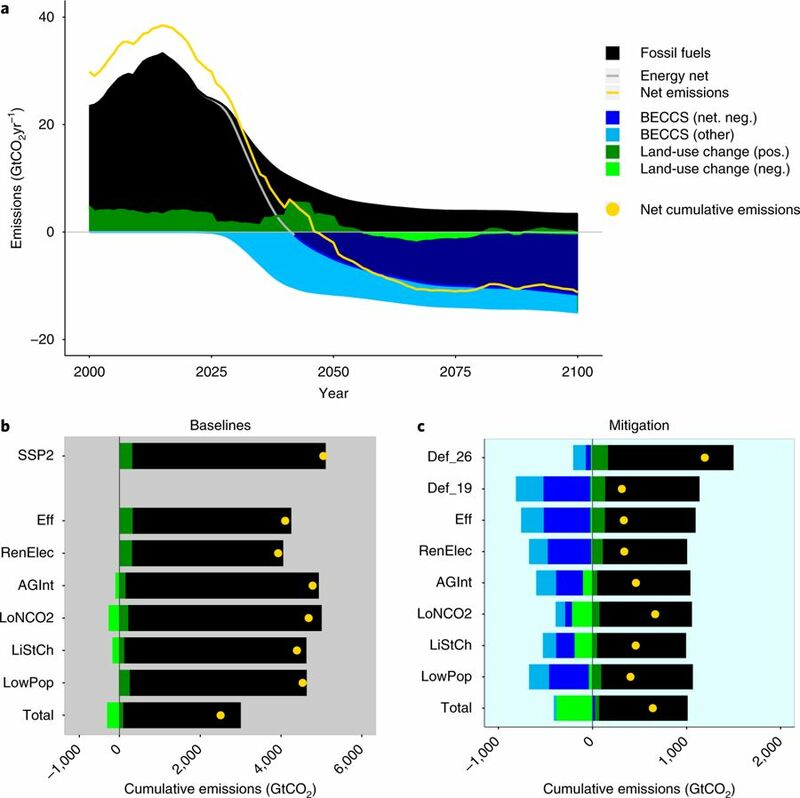 al (2018) also just published an array of alternatives to the default 1.5°C storyline, with similar recognition of the uncertainties and risks associated with the conventional assumption of first overshooting the carbon budget and then investing heavily in CO2 removal, largely via BECCS, to reverse that overshoot. Van Vuuren explores not only technological options for achieving the Paris Accord, but also dives into consumption patterns, comparing alternative storyline impacts on CO2 and non-CO2 emissions and land use. The alternative scenarios analyzed by van Vuuren et. al (2018) propose a future energy system characterized less by negative emissions technology deployment, and more by other energy saving actions, including: high energy and materials efficiency, greater electrification coupled with ramping up of renewables, intensified agriculture practices with higher crop yields, reducing non-CO2 emissions as much as possible (including switching entirely to cultured meat by 2050), significant lifestyle changes (less meat-intensive diets, less greenhouse gas intensive transportation, less reliance on heating and cooling), low population growth in most regions, and finally adopting all the above. The policy levers to motivate such changes are not assumed, although the authors do conduct model simulations without and with a carbon tax (Figure 2b, 2c, respectively). The authors also particularly focus on rapid adoption of these measures in the 2020-2050 range, and emphasize that these changes should be linked with improving the welfare of society, or else rapid transitions will never gain traction. However, none of these actions in isolation achieve a 1.5°C future. None, in fact eliminate the need for negative emissions technologies. Many of them do significantly diminish CO2 and non-CO2 greenhouse gas emissions, and lessen projected future reliance on negative emissions technologies like BECCS and DAC. These approaches can potentially buy valuable time while negative emissions technologies are developed. Van Vuuren et. al make the case that since BECCS has many unknowns, and can run the risk of compromising potential croplands, that these alternative scenarios should be considered in more model storylines. For instance, actions like lifestyle change, and agricultural intensification would substantially decrease non-CO2 emissions; and efficiency, electrification with renewables, and a low population would drive down CO2 emissions (with the latter two providing the biggest reductions by 2100). Notably, none of the alternative scenarios laid out by van Vuuren et. al achieve neutral or negative emissions without implementation of a carbon tax. All scenarios result in a rapid transformation of both energy (with low carbon energy ramping from 15 percent to 85 percent by 2050), as well as land use. Obersteiner, M., Bednar, J., Wagner, F., Gasser, T., Ciais, P., Forsell, N., Frank, S., Havlik, P., Valin, H., Janssens, I.A. and Peñuelas, J., 2018. How to spend a dwindling greenhouse gas budget. Nature Climate Change, 8(1), p.7. van Vuuren, D.P., Stehfest, E., Gernaat, D.E., Berg, M., Bijl, D.L., Boer, H.S., Daioglou, V., Doelman, J.C., Edelenbosch, O.Y., Harmsen, M. and Hof, A.F., 2018. Alternative pathways to the 1.5° C target reduce the need for negative emission technologies. Nature Climate Change, 8(5), p.391.